You must make reservations at least 5 minutes in advance of the time at Texas Bleu. Texas Bleu is an American steakhouse that serves farm-to-table cuisine featuring local produce. The restaurant, the newest addition to the old downtown Keller dining scene, is located on the corner of Main and Taylor Street. was seeing and hearing the kitchen activity at our table in the bar area. The lighting in the front of the restaurant was a little too dark, and the patio was a little bright. So we chose to sit in the bar booths, but looking at the kitchen activity distracted me from our meal. Food was tasty but everything was lukewarm when it came out and cooled off too much before we could finish it. It was a nice place, but hard to pay for the quality when it’s not hot when it comes to the table. I didn’t complain but hoping it will be better next time. Loved the oversized wine glasses and relaxed atmosphere. 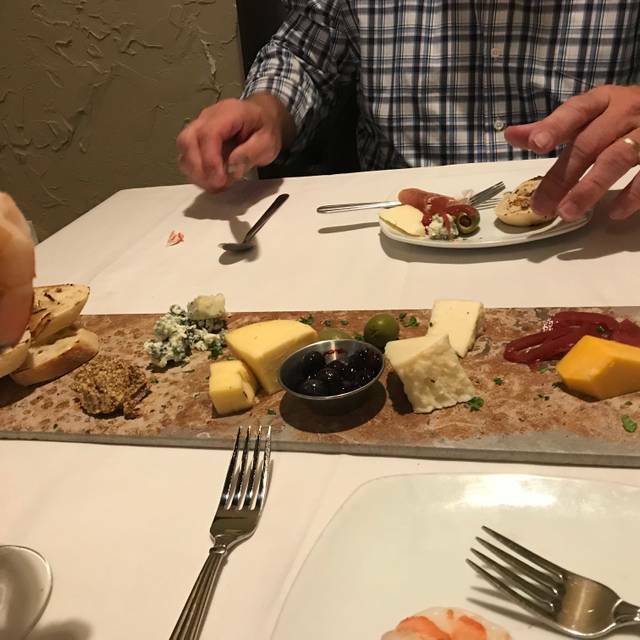 We had the cheese tray that had some fantastic varieties. Our steaks were prepared perfectly and the whole evening was fantastic. We will definitely go back soon! Great food, great wine, and great service. My wife and I will definitely be back in the future. Thank you for a wonderful evening! Steak had a lot of grissle in it, not worth $48. Definitely will not be back again. Food was excellent. Service not so good. Waiter was too young, did not know a lot about the bar selections. Steaks were cooked to order and very tasty! They were out of so much food! It was a Friday night during lent and they were completely out of all seafood as well as their cordon Bleu. Service was okay. Drinks were so strong it was like drinking lighter fluid. Patio seating on a warm evening was the best thing they had going for them. This was my second time going there and we won’t be going back. The food was good but the service was AWFUL. The waiter forgot the wine menu when requested then once he did bring it they were out of the first 2 choices that I chose so finally I found a wine I wanted that was available..the waiter forgot it. We never received steak knives which we asked for so we had to use butter knives. After our frustration we just wanted to leave and be done with it. He hands me the check & he had charged me for the wine that I never received. Not a great experience and I will not be going back or recommending. We went for an early seating for husband’s birthday. We were seated in the bar area, which is why I gave low marks for ambience. The food tasted OK, but the plates were cold and the food was not at its optimum temperature when it was served. I think it would’ve been a much better experience if we had been seated in the main dining room and if the food had been served at the proper temperature. I asked for my steak to be cooked medium and it was cooked medium well almost to well done, just an off night, but our waitress was very nice. We might give it a second chance, overall we were disappointed. We were given a discount to make up for the less than perfect experience. Took over 45 minutes. Food was disappointing. Martini was very small. Took my mother there for her 80th birthday celebration. As always, the food was amazing, though we were let down that one of the entrees listed on the online menu was not available for our evening. The waitstaff were "on point", including the young man that had just started working there. Little touches that go unnoticed in food service nowadays, like waitstaff serving only to the customer's right, and NEVER handing a customer their plate, are on display here. Not the cheapest place to eat, but for the dining experience AND high-quality food, Texas Bleu cannot be surpassed. Highly recommend. Great service.... nice evening overall! The steaks are Great the service was good. It is a small place that is furnished alright. nothing fancy but still nice. The prices are average it is not expensive not cheap. However the food was really good. Try this’s establishment you will be happy with the quality of th food. Food was soooooo good! Service was great. Would recommend, have recommended to a friend. Steak was perfect. Flavor was perfect! Nothing spectacular. Food was good but pricey for what it was. Not too impressed, I felt like we were in a 3 star restaurant. Food good. Service was horrendous. If you are going to charge the prices they do, you will have to employ better than high school kids who have probably never eaten at a great steakhouse. Especially on a Saturday night! Food was good, although the wrong order came out for one of us. Service was good. The downside was it was extremely cold in the room. People were wear jackets and coats. We really like Texas Bleu, bit this visit was below our expectations. Delicious. Period. Service is great. We try to go as often as we can and it's excellent every time! This was our first time to eat here and it won’t be our last. It is a small cozy dining room and the food was very good. Hard to judge, I feel like the Valentine special menu was not their best effort for food and not their normal menu items. Our first time and the Valentine menu was too limited. Needed a steak other than the Oscar filet and two desserts, not one especially since the cheesecake was a tiny square out of what looked like a pyrex dish and 1/2 inch thick. You would think for a set $100 they would offer 2 apps, 2 ent and 2 desserts. I feel at best we got about a $45 dollar meal for $100 plus drinks, tip and tax. Again, I do feel this was not representative of their normal menu, I hope. We may try it again, not on a holiday. Do not go on a busy night meal was good wife’s came out wrong they took it back but did not take mine. When her meal arrived mine was cool. Also it was a special menu because of holiday but I would have expected more beef choices. Really like this place just not on a special occasion. Excellent food and great service. One of the few upscale dining restaurants in Keller. Great bar area and outdoor seating when the weather gets warmer. Will be back. This place has went down hill. The was not interested in waiting on our in the least. Glasses were spotted and dingy and the menus had grime on them. The food was OK, in the past The food was always wonderful. I’m not sure if it was just a really off tonight or maybe this place is having trouble. 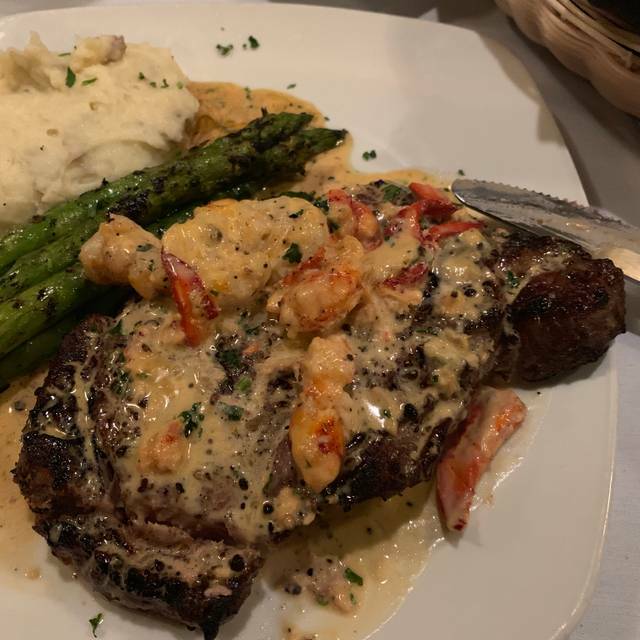 My husband and I took our daughter an her husband to Texas Bleu for her birthday. We had a delicious dinner and the service was wonderful. We had a really terrific evening at Texas Bleu. My 5oz sirloin was cooked exceptionally well. The appetizer, quail knots, would be a great addition to the entree section. The service was good however our server could be more energetic and introduce the menu. Overall a good experience. Had a wonderful New Year’s Eve dinner for our first visit to this restaurant. For starters I had the shaved Brussels sprout salad that was delicious and my husband enjoyed his wedge. For our main course, my husband had the filet and I had the redfish. Food was delicious and served by a very attentive waiter. We are looking forward to returning again soon! They were out of stock of several wines, however provided substitutes without an additional cost, which was nice. Texas Bleu was a lovely restaurant with delicious food. The steaks were flavorful and juicy and the chocolate cake a perfect ending. The atmosphere was nice. To help improve Texas Bleu, the wait staff needs training. For example, remove the salad plates prior to trying to set down the main dish on the table. On the same note, since we were all drinking water the extra water glasses and wine glasses should have been removed at the start of the meal. I did ask the waiter to take the wine glasses when he delivered the appetizer (which I assumed he would also take the extra water glasses and he did not). So I set the extra water glasses on a nearby table. First time at Texas Bleu. Food was excellent and customer service was even better. Our server Bethany was awesome and very attentive without being a distraction to our dining experience. Restaurant was closed...confirmed OpenTable reservations, and the signage on the building claimed hours/open. Great dinner! Would like to see expansion of dessert options. Dinner before a holiday party. Enjoyed the food and great drinks! Black walnut old fashioned was superb. I was pleasantly surprised how good this place was. First of all the service was excellent! Our waiter was great. The steaks had great flavor and cooked very well. There wasn’t that many people there but we had an early dinner so I liked the quietness. We will be back again. The blue cheese stuffed mushrooms as "advertised" on Open Table are no longer on the menu. Our server said the times were also wrong on Open Table but could not get corrections made. Their famous Blue Velvet cake was not available either. The food was good, not great. Service was great for our party of 9.